I was having so much fun with Rita’s Oreomisu that I decided to try another version – specifically, one with coffee. After all, tiramisu means something like “pick me up” and while sugar might do it for a little while, I think it needs some caffeine. 1. Break apart the Oreos and scrape the filling into a little bowl. 2. Add mascarpone to bowl with filling and stir until thoroughly combined. 3. Stir in the Kahlua. Taste for sweetness. Feel free to add more Kahlua. 4. Crush 2 of the Oreo halves into crumbs. Set them aside. 5. Assemble towers. Working one Oreo half at a time, quickly dip each Oreo half into coffee and spread with a heaping ½ teaspoon of filling. Stack so that you have 5 Oreos layered with 5 layers of filling mix (end with filling mix). Do this twice to make two towers. 6. Dollop a couple of tablespoon of whipped cream on each of two plates. Set one tower in the center of each whipped cream topped plate. 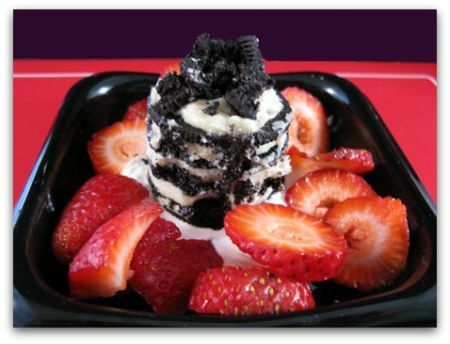 Sprinkle crushed Oreos on top layer of tower. just found this amazing recipe and made them tonight for the bf. we both approve 🙂 they are a-ma-zing! Have you seen the latest creation from oreos? They have banana flavored oreos? I always want to try the new products…but why mess with the original!! Oreos….Kahlua….oh gosh….do you think they would look at me goofy at the grocery story if I went in and bought just those products? For fun I would add a box of tampons and midol….and just laugh!!! I double dare you to do this!! Ok, I now know what I will be picking up from the store: Oreos!! I want that dessert NOW! !